Maybe 15mins of trying on a very quiet road and a woman heading that direction gave us a ride in her truck…with her four dogs. So three people and four dogs in a truck with windows up and what appeared to be the heat all the way up. I had a dog on my lap and was seated in the middle while another kept clawing behind me to come up front. Anyone that knows me knows this is not my favorite position to be in. Let’s just say that deep breathing exercises were in full practice on that hitch. We got to trail at 10:30am and both of us were happy to have a relaxed schedule as we just needed 10-11mi to the next water source and it would set us up nicely to go over the 11,419ft South Summit of Mt Ellen tomorrow morning. We were going up from 5,000ft and there were strong winds to take into consideration, so we thought the 8,000ft mark about 10mi in would be a good spot. 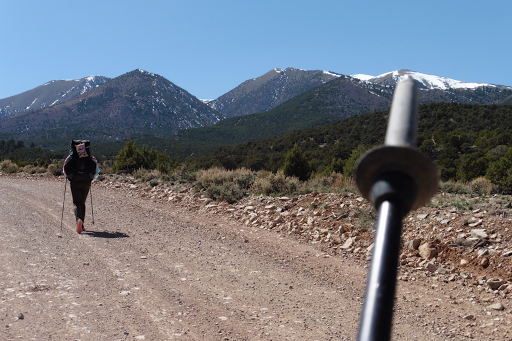 Almost the whole day was hiking up on a dirt road, which we were welcoming of considering that we are both carrying 8 days of food to get us to Escalante. There was a short stretch in a warmer and sandier wash to remind us how lucky we were to have the easy road walk for the first day out. With little water needed, mine actually felt relatively light given how much food I have…making me wonder if maybe I didn’t pack enough. I guess we’ll find out in a few days. Katherine’s pack was unusually heavy and was not making the hike up very enjoyable combined with a tweaked back that flares up from time to time. We were both happy to just take it easy and it was very enjoyable. It was fun to see the Henrys get bigger and bigger as we approached. 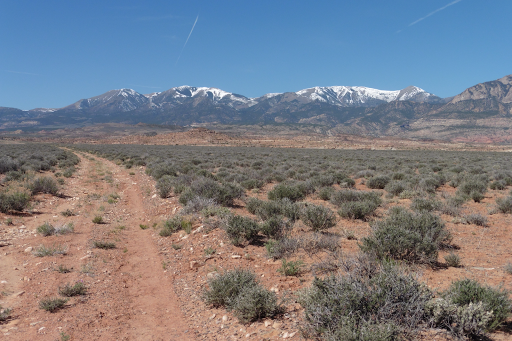 They are are apparently so remote that they were the last mountain range in the continental US to be mapped. We are pretty sure that this is the South Summit of Mt Ellen, the one we’ll be going over. This time of year, it can be a crap shoot of if Mt Ellen has a ton of snow or not and there is even a low level bypass if people need, but we are lucking out that it isn’t high. The hike up went quicker than we expected and we decided to go on ahead and chip away at more of the climb to camp at just below 9,000ft a few miles later. 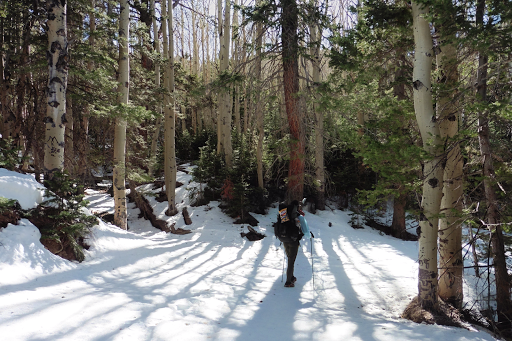 There were patches of snow in shaded parts and we did have to walk in some for short stretches. There should be snow on the ridge as we go over tomorrow, but nothing terrible. 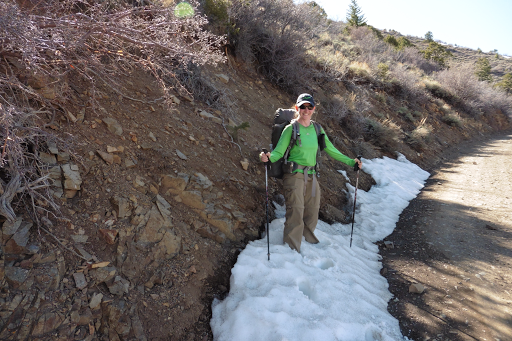 I’m really happy as I know the route up could be covered in snow this time of year and it isn’t bad. We even walked by aspen! It’s quite cold and will probably hover around freezing tonight. The winds are forecasted to die down overnight. We are now just four miles and an elevation gain of 2,500ft away from the top, so it will be nice to get that done early tomorrow. 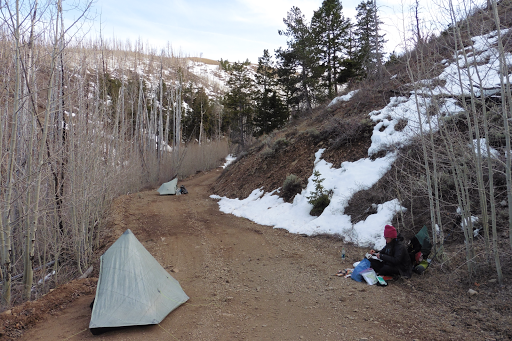 We got to camp at the relaxed time of 5:20pm and are able to camp directly on the road for flat spots. Gavin came by an hour later and decided to hike on a mile further to a pass, which could be quite windy, but he carries a four season tent that he can set up if he needs and he thinks can take the wind. We think this may be the last sheltered spot, so we’re sticking here. It was a great day and surreal to be in snow and not sand. I really like the break and we’ll be back in it by lunch tomorrow probably. It’s just our third night camping out of sand and our 6th night camping with water, so we’re livin’ the good life ha! I had looked forward to watching a show, but was so sleep deprived that I fell asleep writing this well before dark and just now woke up to finish it at 11:15pm. 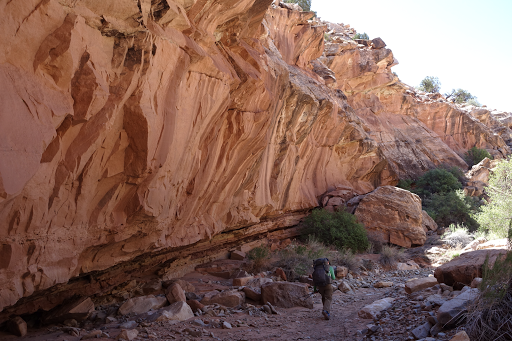 We have a long stretch here to get to Escalante and if we can do a fair amount of miles (~16.5/day) and push a bit we can do it in seven days rather than the allotted 8 so it will set us up to be hitching into town the second half of the day on Sunday. It’s a very remote road into Escalante and some even do a very long alternate in exchange for the hitch as we could wait over 20hrs for a hitch if we aren’t lucky. We know the best time is the second half of the day when climbers and hikers are driving back to town, so that’s why aiming for Sunday afternoon would be much better than the first half of the day Monday. It’s a great leg and we don’t want to make it u enjoyable by pushing too much, but it’s in the back of our mind and we’re just conscious of the timing and going to see if it works out. Alright, goodnight!